(September 16, 2014, by Rosemarie Bernardo – Honolulu Star-Advertiser) The social services nonprofit intends to seek proposals for much-needed renovations. 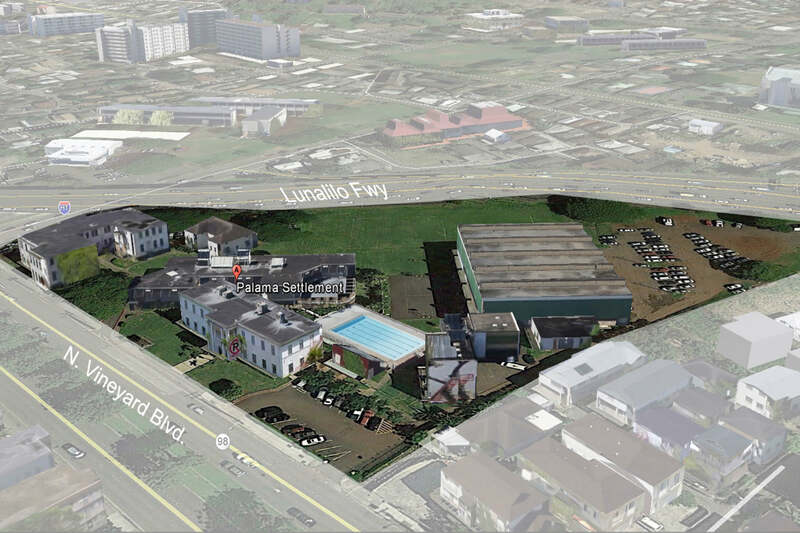 Palama Settlement is looking into redeveloping its 6.2- acre campus that has long served the Kalihi-Palama community. Brian Takahashi of Architects Hawaii Ltd., a firm that has worked with Palama Settlement in the planning stages, said the organization has flexibility in terms of space on how it wants to renew its heavily used facilities. “It’s a nice-sized parcel that is hard to find in the confines of downtown,” he said. Board President Jarrett Walters said the board is trying to determine the best possible use of the land. “Our No. 1 goal as we go through this is that we never lose the vision of Palama,” he said. Palama Settlement is working on a request for proposals, slated to be ready later this year for interested developers. As officials evaluate their options for redevelopment, Wendy Abe, the executive director, said they want to retain the essence of the site. “Our look is so iconic,” she added. “It has so much character.” In 2012, Palama Settlement developed a strategic plan to improve programs, boost participation and sustainability. One of the goals is to achieve a 10 percent increase in revenue a year to sustain and revitalize operations. Officials are considering leasing land on the property as a long-term goal to generate revenue. Such leases become all the more crucial as the settlement begins to clear out occupants in the so-called “tenant building,” a 90-year-old, wooden structure that has had plumbing, electrical and structural problems for years. The board recently decided not to renew leases for 10 tenants in the building because of maintenance problems, as well as the cost to maintain the structure. Offices in the building are mainly used by nonprofit organizations. “We are concerned about the safety of the building,” said Abe. “It’s evident it needs a lot of repairs.” All but two tenants are slated to leave the campus by the end of the year. Bluewater Mission and City Church of Honolulu will relocate to another building on campus. The loss of leases is estimated at $153,000 a year, and Palama Settlement plans to intensify fundraising campaigns to offset the loss. “We have to work harder to replace those funds,” said Abe. The second annual Malama Palama Gala will be held Oct. 25 at The Royal Hawaiian hotel. More information and how to purchase tickets for the gala can be found on its website www.palamasettlement.org or by calling 848-2502. It’s uncertain what’s in store for the tenant building. In better shape next door is Palama’s landmark structure, the Rath Building, named after the founders, James Arthur Rath Sr. and his wife, Ragna Helsher Rath, who arrived in Hawaii in 1905 as social workers to run the organization. Palama provides services to hundreds of people annually. Multiple programs are offered for seniors, low-income families and at-risk youth. Palama has a gymnasium and an outdoor swimming pool. The Pakolea program promotes basketball, football and volleyball; a community services program provides a range of services to low-income and immigrant populations who live in public housing and neighborhoods surrounding Palama; and a computer technology center offers classes and access for families that don’t have a computer at home. Some of Hawaii’s influential figures participated in programs at Palama Settlement in their youth. They include late Edward “Skippa” Diaz, a revered Farrington High School football player and coach, who was involved in the swimming program; Cha Thompson, owner of the Tihati Productions; legendary surfer Ben Aipa; and former Govs. George Ariyoshi and Ben Cayetano.